The ability to manage your learning environment to meet your learning needs. It is easy to imagine the effects of a “toxic” learning environment, one where the learner is not able to access the learning or meet their learning needs. To begin with imagine what happens when the learner is excluded from the learning opportunities. Any explanation or instruction may be impossible to understand, as if spoken in a foreign language (“Blah, blah, blab bla”). Any activities look impossible to complete and actions impossible to mimic as if watching some strange dance being performed without music, rhythm, or purpose. It is my belief that learners soon recognise what they understand and what learning environments they can learn within. Learners also instinctively relate the outcome to effort but in doing so they make value judgments about the learning. Belonging – to a group, of having an identity. Freedom – to choose, to have options, and to make decisions. Fun – to enjoy what is happening. Power – to be heard or listened to. To be acknowledged in a way that provides recognition of emotions. 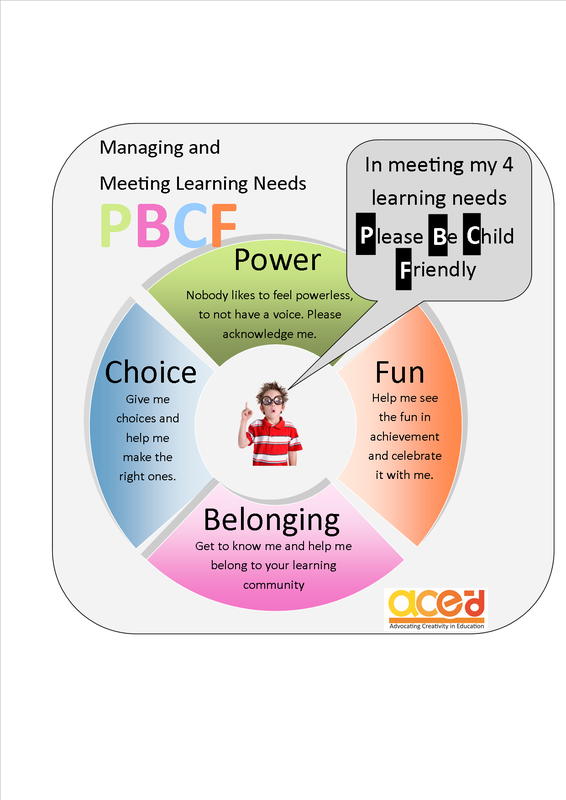 This graphic, part of the “Understanding and Managing Learning Needs” CPD course and e-book, shows how these needs influence the learner and acts as a reminder to the teacher t0 plan to meet those needs. I suggest that where a learner does not have some of these needs met for some of the time they will begin to withdraw from the learning environment, they limit their interaction and reduce their efforts. It’s easy for us to remember to include ways of meeting these in our teaching. The acronym PBCF is remembered using the mnemonic “Please Be Child Friendly”. As a learner, and once this process of withdrawal begins, we have to rationalise what is happening, especially if we are in a group and others “get it” and we don’t. This is where the work and theories of Carol Dweck [ii] come into play. I believe learners attribute learning to “aptitude” as a way of rationalising their inability to learn within the learning environment they find themselves in. One response of educationalists has been to describe learners as having “learning styles” or describe their aptitude as “Multiple Intelligence”. Some have advocated teaching students according to their styles. This approach has received both support and derision. I happen to believe there is something in it but see it as a way of describing the symptoms of the problem and not the root cause. To me a preferred style suggests a “learning need” outside of the four I have mentioned earlier and it also suggests an aspect of “LQ” the learner has already identified but without recognising it. The lack of recognition of LQ is because no one has described or discussed it with the learner. In my own work where I have explained to learners the concept of LQ and impact it has on their learning and even more importantly what they can do about it the results have been nothing short of remarkable. Whilst I have no empirical evidence to support my concept of LQ other than decades of teacher, the very idea speaks to those I have worked with in a powerful way. It can bring adult learners to tears and it can give new energy to young learners because it explains to them and gives them the tools to do something about their learning mental maps and beliefs about what they can and cannot learn. As teachers or as those who manage learning environments we can do something about creating the conditions for LQ to flourish. I am not suggesting the multiple learning styles approach but instead introducing the concept of LQ to learners and then giving them the room within the learning environment we manage to exercise it. I am advocating the creation of a learning environment where we empower the learner, where we pass the responsibility of learning back to them. Not in a way that leaves them “high and dry”, or in a “sink or swim” situation but in a way where they have the knowledge and understanding of LQ and are skilled in managing their own learning environment. 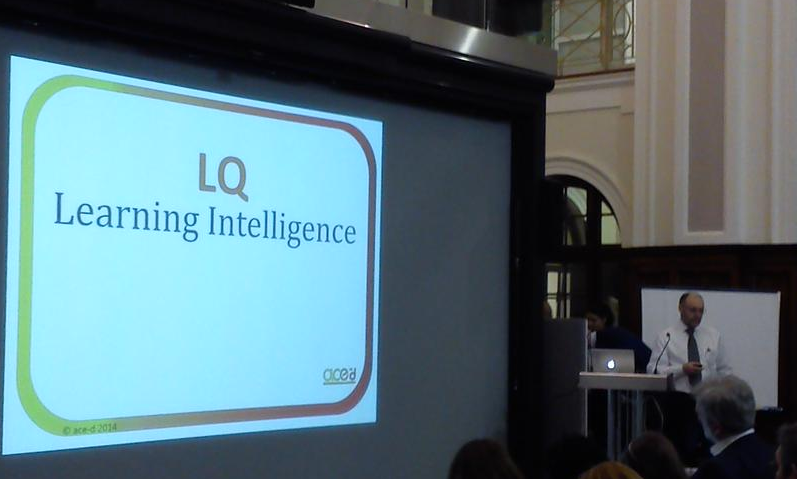 This is the first of many articles on the concept of LQ (Learning Intelligence) as proposed by ace-d. I would be pleased to hear any comments or receive any questions you may have about LQ. I am available for conferences, workshops, TeachMeets, plenaries, online training, course design, webinars, and consulting. Your organisation can reach me at kevin@ace-d.co.uk to discuss arrangements. There are now many articles covering a range of aspects of LQ. Move forward through the blog to find out about links between LQ and resilience, empathy, designing, boredom and many more. [i] My book “Understanding Learning Needs” covers these aspects in more detail and provides for practical reflection and analysis for the teacher on meeting these needs for the learners in their charge. It is available from www.ace-d.co.uk – Go to News and Downloads page where you will see the link. Since it is in pdf format you will receive your copy instantly. Please also see the work of William “Glasser Choice Theory in the Classroom” on which this work is based. [ii] According to Dweck, individuals can be placed on a continuum according to their implicit views of where ability comes from. Some believe their success is based on innate ability; these are said to have a “fixed” theory of intelligence (fixed mindset). Others, who believe their success is based on hard work, learning, training and doggedness are said to have a “growth” or an “incremental” theory of intelligence (growth mindset). Individuals may not necessarily be aware of their own mindset, but their mindset can still be discerned based on their behaviour. This is interesting. I followed a link from a Mindshift post. I like the shift here to what the learner is/can do to manage his/her learning environment. I’m looking forward to reading more of your ideas on this. In short – yes. I came across Glasser’s work late in my teaching career when I have had time to reflect on what works and does not work (32 years into it actually) and recognised the simplicity of his identification of needs in relation to my teaching experience. I have acknowledged his work in many of my writings and posts and it forms a component of the foundation work for LQ. What I found though was a need to put Choice Theory into a “working context” for teachers. For example “Power” gets a bad press in education, the idea of giving power to students is difficult for teachers who want to be the “sage” and not “guide”. It is better to think of the opposite, of being “powerless”, and word association exercises bring up words like “being heard, having a voice, being listened to” and these are more palatable in the learning environment prevalent in many classrooms. I left out survival for a similar reason. I have written an e-book, “Understanding Learning Needs” which challenges teachers to show how they plan and meet these needs in their teaching. I have also developed a training course where teachers get to map their teaching strategies and approaches against these needs. Both have been very effective in helping teachers improve the learning environment, build better relationships with learners and reduce conflict. There are over 20 posts on LQ here many of which explore it from both the teacher and learner perspective. The posts are part of my refining process in defining LQ so feedback and comments such as yours are very important to me. Many thanks for taking the time and enjoy the posts. Many thanks and for taking the time to bring this to my attention. I will certainly spend some time studying the document . Awesome! I thought it might do just that: support your ideas. Made it eventually!The new post is up on Bandura’s theory.